Which is your favourite of the three best Norwich goals so far this season? The 18-pass move against Villa? City’s third goal in the romp at Hillsborough? Or the 97th-minute winner against Millwall? Those three exquisite moves all extoll the boldness and belief that is surging through the club we care about. And each of the three goals says something significant about why our club are top of their division. You can find the first one — the goal against Villa — and read Chris Lakey’s knowledgeable analysis here. Hear, hear. That goal was, indeed, made on the training ground. And it epitomised and justified the philosophy behind the new Norwich way. It even silenced the “Get it in the box” bloke who sits near me in the Community Upper. Briefly. He wallowed in his misery last season, when Norwich often appeared to prize possession for its own sake, and without purpose. But the players had to learn not to always go forward, even when urged to do so by their own supporters. They had to be persuaded to keep the ball before they could be encouraged to use it productively. Every fan to whom I have spoken from those who went to Germany with City in the summer saw clear evidence there of a much more proactive possession. I think positive passing was apparent in this season’s early games too, long before the wins started stacking up. And when the charge to the top of the table began, it was based on retaining the ball — and it has been utterly spellbinding. Some of the football during the second half at Nottingham Forest was as good as I have seen in more than 40 years of watching Norwich. The team rode their luck at the start but they believed in what they were doing and they began to seize control. And they played with a boldness that kept that control. Some of the altered emphasis this season is because of changes of personnel. It’s heresy I know, but I think we’re a better team without James Maddison, genius and lovely chap though he is. He came deep to get the ball last term, and then nearly always caressed it a couple of times before spinning around a couple of times too. That’s not how we play now. Our philosophy is different. The goal against Villa shows that. Look now at City’s magnificent third goal in the win at Sheffield Wednesday. It’s at 2.56 in this video. But the move actually began moments earlier than the clip shows, when Wednesday hoofed the ball forward from their own area towards Atdhe Nuhiu. The home fans roared as the 6ft 5ins Kosovo Albanian lumbered after it. But Christoph Zimmermann, an inch shorter but quicker in mind and limb, was unflustered. What followed was the perfect counterpoint to the dinosaur football Wednesday were attempting, and it was the contribution by the mighty Zimm that made a really important point. Christophe played a diagonal pass, back across his body, to Aarons. Why do you suppose he didn’t play the ball the way he was facing, either knocking it back to his ’keeper or lumping it away for a throw-in? That’s what most centre-backs would have done. My point is that individual players are performing noticeably better this season and that can only be because they are being coached well. Last season Zimm, Timm (Klose) and him (Grant Hanley) all looked profoundly uncomfortable with the ball at their feet because they knew that simply “clearing their lines” would be criticised by the coaches. There was a lot of passing to and fro along the back line — like a Chuckle Brothers routine, with frowns. But currently, Zimm and Timm are joining in the build-ups. Timm takes the ball wide on the left to interact with Jamal Lewis. Zimm is happy to advance on the right, looking for Aarons or Emi Buendia. Sometimes Timm or Zimm will nudge a short ball forward in the middle to Mo Leitner or Alex Tettey. There is movement and motive and, as Mr Lakey said, it’s been honed on the training ground. Tettey is playing differently too. He’s always been a brilliant disrupter, great at reading the game and resolute. But his passes were invariably five yards sideways or backwards, and seldom hit crisply. This season, his first thought is to try to be positive with the ball or to stride forward with it. While the rest of the team have learned the value of simply giving the ball to someone in the same coloured shirt, Tettey, who always held that belief, has now been encouraged to be bold. He’s 32. He’s been a full international for a decade. But suddenly he’s playing differently and better. That has to be about the coaching at Colney. The new, improved Tettey began the move that led to City’s third goal against Millwall. But I want to talk about the winner. Added time is ticking away, City have a free-kick in their own box and Millwall players sprint back hurriedly. In City’s situation, most teams would get themselves and the ball forward as quickly as they could. But Farke’s folk keep the faith, keep the ball and pass, pass, pass. I make it eight passes, including the free-kick. The highlights of that incredible game are here. I think that late winner emphasises City’s belief in the club’s philosophy is total and unwavering. It is a philosophy that is about more than just keeping possession, though. There are two other strands of the club’s newly reconfigured DNA. One is the doctrine of marginal gains, made famous by cycling coach Dave Brailsford and which means, in simple terms, pay attention to small details. Make every little thing a little bit better. So, for instance, the Norwich of Stuart Webber is a club where they now have a throw-in coach — and watch how seldom the ball is lobbed in for a contested header. Players move about until one can receive a short throw to his feet. He gives ball back to the thrower and City etch intricate triangular patterns until there is an opportunity for a telling pass. The final key element of the new Norwich way is to get young players into the team, preferably “home-grown” lads. Some supporters say Daniel Farke was lucky that Jamal Lewis and Max Aaarons were available to him. But it wasn’t luck that pitched Aarons into the first team for his League debut in the derby game at that place in Suffolk. Other options were available to Farke that day. But he’d seen Aarons score in the Carabao Cup five days earlier, and judged him ready. So, not luck. Boldness and belief. Todd Cantwell had never played in the middle of a midfield three in his young career until Farke asked him to do so on his League debut at Reading in September. Farke had seen that the young man had the necessary attributes. More boldness. More belief. Farke’s brief, upon appointment, was to give kids their chance. So he’s doing the job he agreed to do, the one he wanted to do. But it requires that boldness and belief. It’s all part of a longer plan: the attempt to answer a long-standing question. How do Norwich survive and thrive in the Premier League if and when they get there? 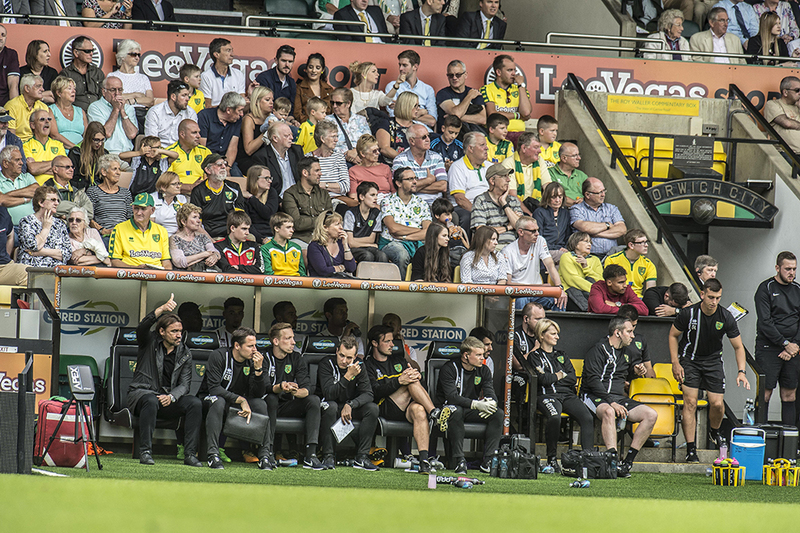 The board, Webber and Farke all believe that the new Norwich way is the only way. They believe that by improving every little thing that they can, by producing and, crucially, using good youngsters and by playing a game based on patient, precise and productive possession they will be able to prosper in the Premier. That’s a lot of pees, I know. But it’s time to give pees a chance. And a couple of bees: boldness and belief. Now, excuse me, but I’m going to look at those goals again. Hard to disagree with anything there – an excellent analysis. Farke has indeed done a great job, seemingly never compromising his philosophy in the process. Just as things are coming to the proverbial boil so nicely at City, we are hearing strong rumours that Southampton are interested in Stuart Webber. We’ve already lost Steve Stone – a completely different functionary to Webber of course – so I pray we manage to retain Webber. I wouldn’t like to see Farke on MotD in a parka with a Soton badge on it. Brilliant article Mick that really hits the nail on the head. Still early days yet I know, but the momentum seems to be building. Long may it continue. A cogent and compelling (sorry, I’ve moved to ‘c’s) analysis of where City are, and how they’ve got there. Farke has clearly tweaked his philosophy along the way, as he’s adjusted to a new league in a new country; the signing of Grant Hanley after Millwall was an obvious adaptation. But the core philosophy is clear and unchanged. In effect, Farke is doing exactly what he said he’d do and why Stuart Webber hired him. That move for our 96th (97th?) minute winner against Millwall wasn’t just one or two players keeping the ball. By my count seven City players were involved (Leitner, Tettey, Zimmermann, Buendia, Lewis, Vrancic and Pukki), and the ball never left the turf until Teemu dinked it over the keeper. Sensational. I think you missed out Timm Klose! As supporters we are often asked to vote for goal of the month or season. I cannot remember a better pass of the month or season than Vrancic’s to Pukki for that unbelievable winner against Millwall. The list of special moments is certainly growing. Buendia’s to Rhodes wasn’t bad either! Precise, perfect and well penned. That’s a good article Mick. With whispers of Southampton interest in Stuart Webber then the board will hopefully have learnt a vital lesson from Stuart himself and developed a contingency plan for the inevitable days that the big boys come calling. The Norwich model is no doubt being monitored in the higher reaches of the game and so interest is always going to be an issue that we must be prepared for. It’s a great piece Mick, thank you. A quiet revolution is taking place and I’ve never seen us look better. Patience is the key now as teams will adapt to counter our style. The way we overrun opponents in the final quarter of games is awesome to see. Time for keeping feet firmly on the ground. A very good analysis of city and a good read. As someone has mentioned we have already lost a gog in the wheel with Steve Stones departure the last thing we need is for Webber to up sticks for the south coast and premiership a few weeks later. Huddesfield have survived after Webber left but as far as I can gather his Wife wasn’t a part of the set up so possibly it would be 2 for 1 if he did leave. Les Reed has done a great job at Southampton over the last few years but now they are not doing so well he is taking the blame, it could also be that their board would prefer someone else to make the decision on Mark Hughes. As Martin referred to it could also mean the departure of Team Farke, I just hope the board has the nerve to tell Southampton where to go or ask for a very large compensation package that would put them off, but there is another rumour they might go to RB Liezig for their director of Football as he worked there under Poch. Alex: I too hope they vehemently tell Soton where to go. Possibly and not with my usual cynical stance Zoe Webber could be the key to this situation. We all know a job can be found for anyone everywhere in almost all situations but in this case why would Zoe give up a genuine and influential position for the unknown? Stuart Webber will not be here forever. We all know that. He’s only 34 or 35, full of ambition and I don’t blame him for any choice he might make. But he’s got more work to do here yet. I pray he stays, I really do. What worries me is that the Soton fans want Mark Hughes out and that could lead to a mass exodus for Webber to Farke and his entire backroom staff. But I’m so pessimistic in life in general that if I were a GP-botherer I would be on Valium or something, which I’m not and I’m not. I couldn’t bear to watch a project that is reaching fruition being reduced to ground level just now. Let’s hope it does NOT happen. This is surely the first piece Mick has written where no one’s commented on him being an apologist for the board? In all seriousness, MD could be forgiven for congratulating the board on making some good decisions, decisions that have got us where we are. I know some people will despise Delia until the day they die but her willingness to accept that she’s got things wrong, change tack (sometimes completely) is pretty bloody admirable. How many owners would do that? This season may end up disappointing us but what I love about NCFC is we’re never beaten, whatever the doom-mongers would have us believe or even want. There is always a way, and we keep finding it. Excellent Mick; I’m sure you’ve put into words what many of us are thinking. Let’s face it, last season was pretty dire, but how many of us could honestly say that they expected us to be where we are now, and more importantly, playing the way we are. I’ve been a fan for more than 50 years, and think that (Bayern and Inter excepted), the football now is as good as its ever been. I find it interesting that both Alex Neil and Alan Irvine were not convinced in the quality we had in the reserve / u23 set-up. I dip my cap to Webber and Farke in giving them the run and also placement out on loan in the case of Godfrey and Cantwell. On a separate topic, I wonder, bank balance aside, if Jacob Murphy regrets the last 18 months and his lack of action?